Remember on the old show Sanford & Son, how it looked like Fred and Lamont Sanford lived in a dump, but it was really just a very junky house? 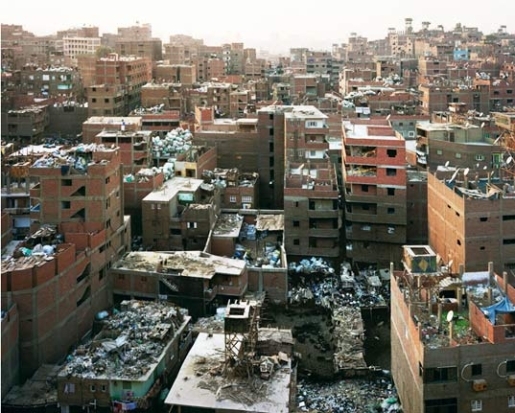 Well, in Cairo, Egypt, people really do live in a dump. Not a raggedy house, an actual dump. They’re called the Zabbaleen, and they live in what is known as Manshiyat Naser, or Garbage City. Amazingly, this is where most of Cairo’s trash goes, and an estimated 70,000 people live here. It makes for some incredible images. Until recently, Cairo had no organized trash collection. The city’s population of Coptic Christians lived and worked in Garbage City, collecting the trash every day. The organic scraps were fed to pigs (which were wiped out in 2009 thanks to government fears over swine flu) and the recyclables were used to keep the various Coptic families’ coffers filled and to sustain their livelihood.